Greetings, this is probably a simple question. I am writing a how to document and one of the steps is to explain how to find the path to a folder on their computer. So you know the folder name. Is the easiest way to do a search on it, click properties and copy the location ? I would think there is an easier way to do this. Thanks ! Are we talking about a custom folder here? or a OS type folder? like say My Documents, or.. My Pictures, etc. I am writing instructions on how to download Legal Sounds music directly to iTunes so iTunes automatically loads these songs into its library. So I imagine some people who read my instructions won’t know how to find the path to the iTunes folder called “Automatically Add to iTunes”. So that is what I want to explain to a user on how to find the path in the most painless way possible. 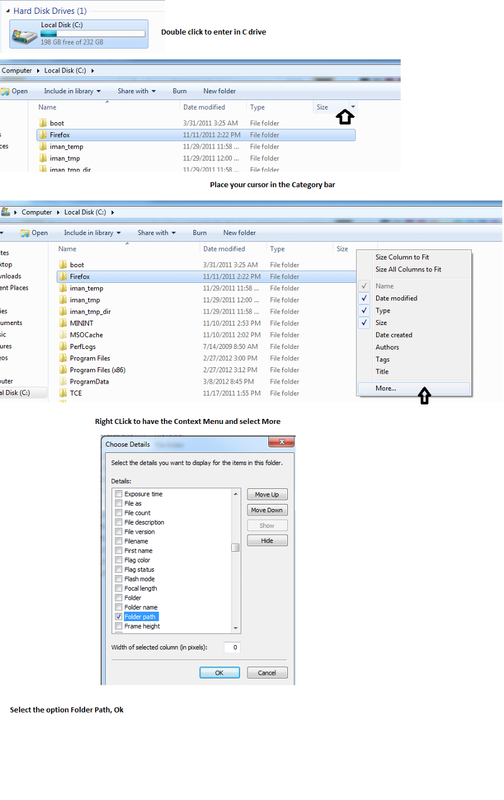 Best way is you choose Folder Path from the windows explorer. I am using MS Windows 7 ..so the steps goes like..
Open the folder in Windows Explorer, then click in the bar where the folder name resides (not on it, but near it), then press F2. Now copy the path and copy it to your document. This is the only way to be clear about paths. I'm not sure how you use Explorer to open the folder in Windows Explorer ? Here is the detail steps for you. Cheers! This isn't working and I missing something ? What do you mean near it ? I don't see the path ? "Open the folder in Windows Explorer, then click in the bar where the folder name resides (not on it, but near it), then press F2. Now copy the path and copy it to your document. This is the only way to be clear about paths"